One of the challenges for teachers in keeping track of their pupils e-Portfolios and profiles is finding the blogs. In a future phase of development we hope to provide a way for teachers to get updates pushed to them from pupil e-portfolios. For now the process needs to be a bit more mechanical. Urls for pupil blogs need to be shared with the teachers who need to view them and other pupils if you are going to do peer assessment. Before Oct 2014 in ‘old’ glow these links were generally gathered in a weblinks web part in SharePoint. This method will still work. Other options might include a shared Word document, OneNote, or the creation of a shared Blog or Wiki with links to a set of e-Portfolios. 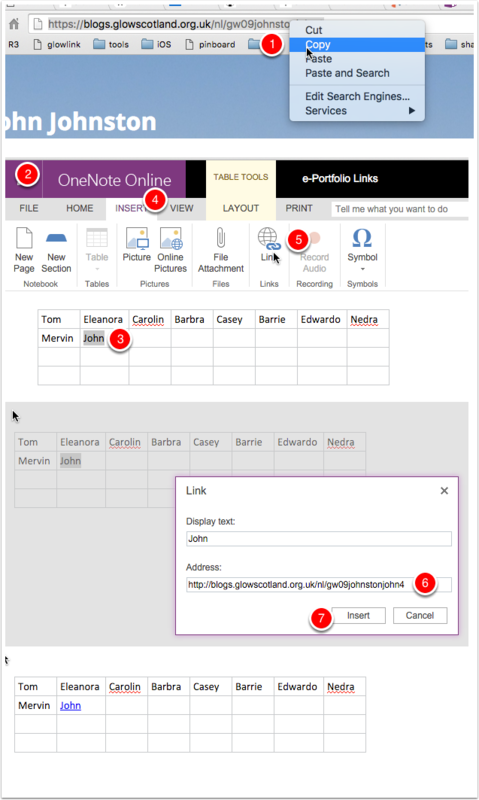 This is one way of setting up OneNote to link. Microsoft OneNote is a computer program for free-form information gathering and multi-user collaboration. 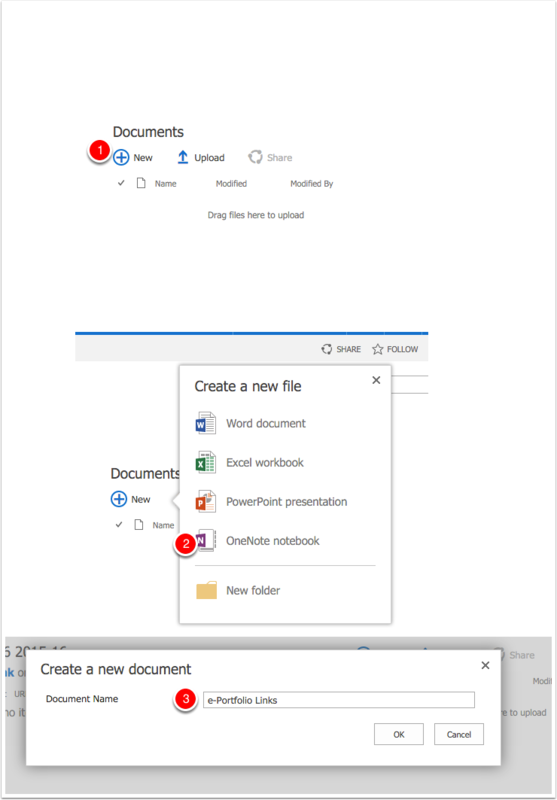 OneNote documents can be created in OneDrive or as part of a Sharepoint site. It maybe the best idea to use one as part of a SharePoint site as it will not be tied to any particular user’s account. It maybe that there is already a suitable site in your school where pupils can edit the OneNote file. Alternatively you may want to create a site which will have aOneNote attached to it or to add a OneNote file to a documents webpart in an existing O365 site. If you are using a OneNote class document you might want to use that, but remember you will have to pass on the links to other teachers at some point. If you have a SharePoint site that pupils can access you can either use the OneNote attached to the Site or add one to a Document Library. In a Site click on the + on the Document webpart. In the dialog name it. Your OneNote is created and you are taken to it. Pupils will then add the link to their e-Portfolio to their name in the OneNote. Navigate to the OneNote file. For teachers regularly visiting e-portfolios we would recommend using the Glow Blogs Reader to follow all the ePortfolios and get notified of new posts from them all on one page on their Dashboard.